what I'm researching is the life and the life-style of the Roman Catholic big house—by no means as thick on the ground but still there; what we might call a Roman aristocracy. . .and the task I've set myself is to explore its political, cultural and economic influence both on the ascendancy ruling class and on the native peasant tradition.—Tom Hoffnung, the American outsider in the great house of the O'Donnell family overlooking the village of Ballybeg in County Donegal, Ireland. Tom Hoffnung (Rufus Collins) the American scholar for whom Ballybeg Hall, the setting for Brian Friel's 1979 play Aristocrats, is a research laboratory of sorts. As staged by the Irish Rep's artistic director Charlotte Moore, Tom's visit with the O'Donnells is given exactly the exactly right intimacy it calls for. And, with Anton Chekhov's plays showing up on stages all over New York (Already on the boards: The Seagull on Broadway, The Cherry Orchard at BAM; coming up Uncle Vanya at Classic Stage and The Three Sisters at the Classic Theater of Harlem), it's easy to see why Aristocrats is known as Friel's most Chekhovian work. 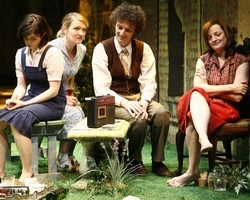 Like Chekhov, Friel created a melancholy yet often funny picture of a once wealthy landowning family as well as some outsiders closely involved with them. But while all Chekhov's plays have similar elements, the O'Donnells reunited in the big house on the hill overlooking Friel's favorite fictional village in Donegal County, bear the closest a kinship to the Prozovs of The Three Sisters. The reason for the reunion inAristocrats is the wedding of Claire (Laura Odeh), the youngest sister. A joyous occasion, right? Wrong. It takes just minutes to see that this is not exactly a joyous event and that the family has emotional and economic problems. The never seen groom owns a successful grocery business, but he's also a less than romantic widower at least twice Claire's age. The marriage will round out a pattern of having the aristocratic sisters dependent on men from a different social strata. Thus their lives are a microcosm of escalating social changes that are about to explode. As the Russian revolution hung over Chekhov's landscape, the personal events at Ballybeg Hall are tied to the "troubles" that turned Northern Ireland into a battleground. The clouds hanging over Claire's wedding aren't limited to it being more practical than joyous. The bride-to-be, seems to have inherited her mother's depressive personality. Having allowed her father to stifle the chance to make something of her musical talent, her piano playing now adds a musical layer of melancholy to the play and will be used to teach the children of the man she is marrying but obviously doesn't love. As for the father (Geddeth Smith), a once a powerful district judge who ruled Claire, as well as her sisters and brother with an iron hand, he is now a bedridden, incontinent stroke victim. Friel keeps him off stage except for one brief appearance and as a voice heard on a baby monitoring system installed to cut down on the endless stair climbing of Judith (Lynn Hawley)), the oldest sister who is his and the manse's caretaker. However, even though heard rather than seen, the judge remains a chillingly dominating presence, not only courtesy of that intercom device, but through the memories the family gathering stir up. These recollections bring to light the pain of life with a dictatorial father and a mother who committed suicide. They also entail fanciful stories of the mansion's glory days when guests included the literati of the day like Yeats and O'Casey. Another famous visitor, Cardinal Newman, apparently married their grandparents and whose name a far away fourth sister took when she became a nun. Like the country around them, all the O'Donnells have troubled pasts and futures. Though the judge was indifferent to politics, Judith's role as his nurse was preceded by her participating in the civil rights Battle of the Bogside. Her political activism ended with the birth of a baby by a foreign journalist which she was forced to have raised in an orphanage. Alice (Orlagh Cassidy), the middle sister, is an alcoholic living in London with husband Eamon (Ciarán O'Reilly), the grandson of a servant in the O'Connell household, who has at one time or another been in love with all three sisters, and turns out to have a greater attachment to the "big house" than any of them. While the sisters are all damaged goods, their dysfunctions pale when you compare them to their brother, Casimir (John Keating). Though appearing to be the happiest O'Donnell on stage, there's something off about his almost ecstatic pleasure at being back at Ballybeg Hall after an 11-year absence, his joyful response to Claire's Chopin infused piano playing, his enthusiasm for her marriage and his references to his own wife and the three sons in Germany no one has ever met. It's consequently more expected than surprising when his fatansy croquet game culminates in a neurotic, tearful collapse. The three sisters' personalities are well delineated by the actors portraying them. However, even Orlagh Cassidy's especially vivid performance as the alcoholic Alice doesn't keep John Keating from dominating the stage as the intense Casimir. His delusional life-of-the party joyfulness gives way to a devastating scene in which he speaks about becoming aware at age nine that he was different from other boys —-- an awareness cruelly reinforced by the father who told him "Had you been born down there you'd have become the village idiot. Fortunately for you, you were born here and we can absorb you." Keating so overwhelms the action, that some might accuse him of scene stealing. On the other hand, there's much to be said for the beautifully understated portrayal of Eamon by Ciarán O'Reilly, co-founder of the Irish Rep and its co-artistic producer. When Aristocrats was presented as part of a Friel Summer Festival at Lincoln Center over ten years ago (review), Les Gutman felt that neither the director or the set designer could compensate for the play's falling casualty to the vastness of the theater where it was mounted. Charlotte Moore and James Morgan, one of the Irish Rep's favorite and best set designers, are more often faced with a very different problem—dealing with a too tight space. In Aristocrats, Moore and Morgan have turned this into an advantage, smartly fitting the library and lawn of the big house where the mostly conversational drama unfolds onto the stage. Morgan's handsome photo montaged backdrop actually turns the theater's large, often problematic onstage support post into an atmospheric asset. You don't have to be Irish or Catholic to understand that power and lack of sympathy for individual feelings is as corrosive within a family as in the larger society -- that music, alcohol and religion are just temporary detours from having to face reality and cope with disappointment and change.
. Irish Repertory Theatre 132 West 22nd Street (212) 727-2737 www.irishrep.org. From 1/16/09; opening 1/25/09; closing 3/08/09——Extended to 3/29/09. Wednesday to Saturday at 8 PM., Matinees are Wednesday, Saturday, and Sunday at 3 PM.